Kitty cats, in the left corner we have Elizabeth and James’ perfect Polished Knuckle Ring; in the right corner we have Urban Outfitters’ sassy Smooth Knuckle Ring. 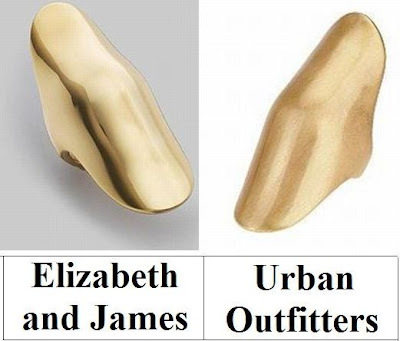 While the Urban Outfitters bauble is constructed out of mixed metal, in comparison to the 18K goldplated sterling silver which makes up the Elizabeth and James gem; for just $24.00, as opposed to the $225.00 required to make the enticing E&J piece yours, it is every bit as essential for the fashionista’s jewelry drawer – at a price that is simply irresistible! What’s your bank account telling you to do, kittens? Will you be a big spender with Elizabeth and James, or play the role of the thrifty fashionista? Thanks to Saks Fifth Avenue and Urban Outfitters for the pictures. Wow..so pretty..just not sure I'd have to have one since I have short fingers. But really such an interesting ring. I have a friend who has her mother's gold plated fingernail for her pinkie that she wore in the 80's. I dunno why it made me think of that. That is a very cool price for this item. Cool! Never seen these before! great find! i love the statement a knuckle ring makes! I'm not a fan of these rings, and I'm a fan of almost everything Elizabeth and James. If I had to choose, it would be the E&J splurge. Hope you're having a good Sunday. Such an interesting find. I do like the 24 bucks price. I have never seen one of these until now. Interesting. This is a great find Erika! Almost identical! Love these types of rings! I will take either, they are both beautiful! I'll definitely take the Urban Outfitters ring! Very cool! Oooh, hard to argue with that price! And it does look just like the E&J one. Ahh I thought that was some kind of weird shoe at first! Clearly need to clean my eyes out haha. I'm not the biggest ring-wearer so I'd go with the cheaper alternative :) Hope you've had an amazing weekend! Love both rings... But I like one price more tha the other one ;) Great post. Thanks for your lovely comments. Large rings are my favourite things right now. I'm definitely picking the Elizabeth & James one: it looks more polished. Definitely the UO version! Unless it's something I"d wear every day (and in this case I wouldn't - I like switching my jewelry a lot), I'd probably save my pennies for something else :) Love both of these though! I honestly can't decide. The E&J version feels more night-time so I'd want it because I think it'd add some interest to a really simple dinner look. The UO version is so everyday though. The sort of dull color means I'd feel ok wearing it everywhere, including to the pool. UO has me smitten! plus there is such little difference between the two. I've never seen anything quite like this. Very unique. And wow, what a great price at $24! Oh~ Thanks for that! I've always wanted that EJ knuckle ring! Perfect match -- what a stunning and luxurious-looking piece! that is quite the ring! Great "for less" post, Erika! The only thing I'm wondering is whether the UO version might leave one's finger slightly... green? Gold is so divine. Gold is glamour. Less is often more. Gold remains. Point. I love MK's and Ashley's brands, great to see an affordable alternative! Great find! I'm loving the rings! Thanks for the info. Cute blog! Oh my goodness, when I saw the pic of those the first time, I thought they were major wedge heels! Ha! These are so close to each other that you'd be a fool to choose the more expensive version! Very nice! I'd go with the UO ring. You do such an amazing job of finding these. Love it! I've been wanting that ring from Elizabeth and James. Thanks for the cheap find! I'll take the cheap one! That ring is too trendy for me to want to spend more than that anyway. So cute. Definitely, thrifty fashionista:) Hope you had a great weekend! I like jewels,but I'm only wearing a simple cross for protection. I was thinking of something to wear all the time and I just found the answer with this post. I actually have this ring from Urban Outfitters.